We continue our series on Hawaii honeymoons with a visit to Oahu. In this article, we feature Oahu as a honeymoon destination by highlighting the areas and attractions that make it romantic. What’s unique or special about Oahu? With the vast majority of Hawaii’s population residing on Oahu, the island has a much greater urban feel as compared to the neighboring Hawaiian islands. Oahu’s HNL airport is Hawaii’s central flight hub. So you will find the most flights into Oahu from the mainland locations. Flights tend to be a bit cheaper into Oahu’s Honolulu airport (HNL) compared to the neighboring islands. Another plus of having Oahu being a hub is that you’ll find many flights to the other island for island hops and day trips. If you are under the age of 25 and unable to rent a car, Oahu has Hawaii’s best public transportation. With TheBus you can get around the island cheaply and easily. From the airport, you can get a shuttle service to and from your hotel. In Waikiki, many tour companies offer transportation in their tour packages. If you live to shop, Oahu offers outstanding shopping. In Waikiki you can find a good variety of shops from stores to buy inexpensive souvenirs to the types of high-end shops you might find on Rodeo Drive. Ala Moana Center, located beside Waikiki Beach, is the world’s largest outdoor shopping center. If you like flea markets, you’ll love Honolulu’s Aloha Stadium Swap Meet. For a more “authentic Hawaiian” shopping experience, check out a farmers market and the shops in Haleiwa on the North Shore. 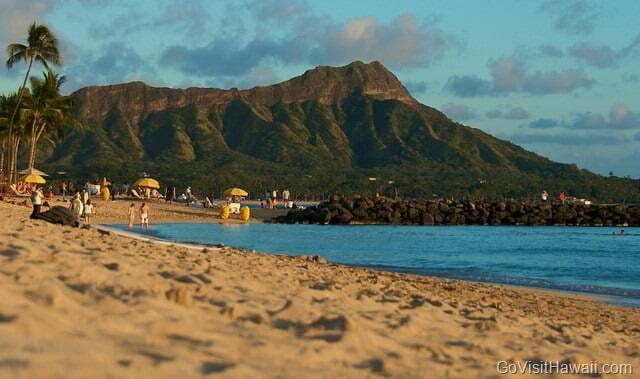 Oahu’s Waikiki Beach is by far Hawaii’s liveliest tourist destination. You’ll find many tasty restaurants and bars featuring live music nightly. So, if a good bit of nightlife is important, Waikiki is the place for you. Though you can take advantage of all the amenities that a city offers, it’s surprising that from just about anywhere on the island, you can very quickly get away from any city hustle and bustle. Within about 15 minutes from Waikiki Beach, you can find yourself on a peaceful jungle hike to Manoa Falls, for example. Oahu’s tropical landscapes do not disappoint. Two, long, green volcanic mountain ranges run through the center of the island. These mountains provide a beautiful backdrop to lovely white sand beaches lined with palm trees. Oahu’s North Shore attracts world class surfing competitions in winter months, where it’s not uncommon for 20 to 30 foot waves to crash to shore. Seeing these massive waves and the professional surfers slice through them is truly a sight you won’t forget. Oahu offers Hawaii’s biggest variety of festivals, cultural events and museums. Oahu’s rich military history is definitely interesting to explore at Pearl Harbor. Water sports galore – learn to surf, go snorkeling, kayak to the Mokulua Islands, go paddling in an outrigger canoe and parasail. Go on a romantic sunset sail. Catch a luau – Oahu has some of the biggest luau performances in Hawaii. Hiking – see our three favorite Oahu vacation hikes. Horseback riding at Kualoa Ranch on Oahu’s lush eastern side or from Turtle Bay on the North Shore. Sight-seeing – check out our popular list of the best budget-friendly sights to see on Oahu. Tour a botanical garden then swim at the base of a waterfall. Testing your navigation skills in a maze at the Dole Plantation. Where to stay on your Oahu honeymoon? Most of Oahu’s hotels are in Waikiki Beach. Here, you can find a hotel to fit just about any budget. All Waikiki hotels are in sky-rise buildings. What might be surprising is with the dozens of Waikiki hotels, very few of them are actually oceanfront. See our where to stay on Oahu page for the list of the oceanfront Waikiki hotels. 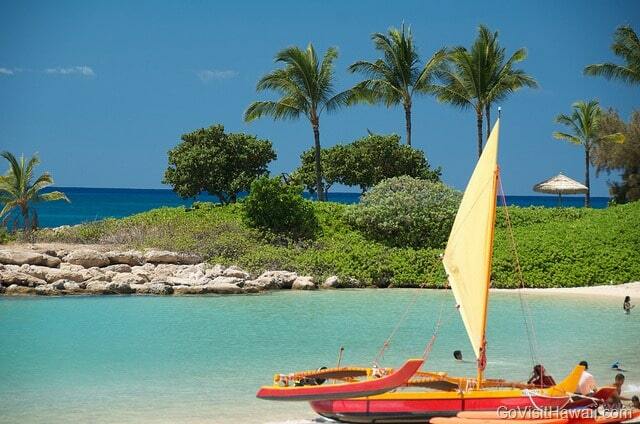 Beyond Waikiki Beach, there are really only three other major tourist destinations – Ko Olina, North Shore and Kahala. Each of these oceanfront resorts have a very different and more relaxed vibe compared to Waikiki. Ko Olina on Oahu’s southwestern, leeward side features two luxury hotels – Four Seasons Oahu and Aulani which is Disney’s first Hawaii resort. 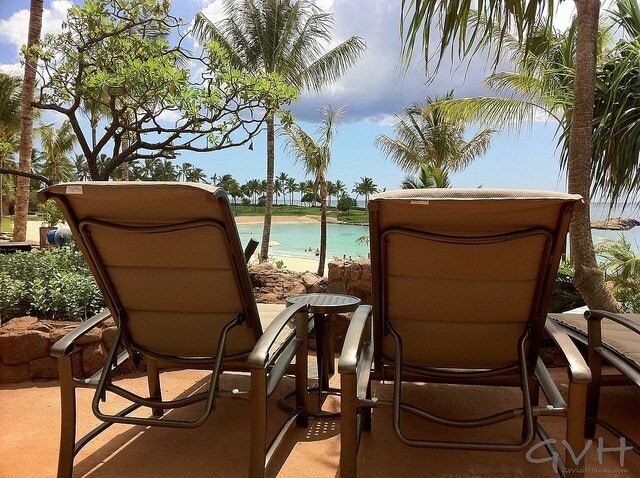 If you happen to be a Disney enthusiast, you will love Aulani. On the laidback North Shore, there’s only one major hotel, Turtle Bay, and it’s an excellent one. Almost every room offers an amazing ocean view. The resort offers lots of fun honeymoon adventures on their property with horseback riding being one of those. If you can afford one of their beach cottage rooms which are more secluded from the main hotel, you might end up rubbing shoulders with a celebrity. On the eastside of Honolulu, you’ll find the Kahala Resort with it’s romantic grounds. Though in the city, the resort feels more suburban. This luxury resort offers excellent dolphin encounters. One extremely memorable dinner that I highly recommend you plan is a sunset picnic on an Oahu beach. It’s oh, so romantic! There’s really too many restaurants to mention, but I’ll highlight some of our favorite Waikiki restaurants with beautiful views, Orchids at the Halekalani, Ocean House at the Outrigger Reef on the Beach, Sarento’s at the Ilikai and Hau Tree Lanai at the Kaimana Hotel. You can find more great Oahu restaurant recommendations here. How much money will an Oahu honeymoon cost? Use our Hawaii vacation budget calculator to help you estimate your own budget. Are there any cautions for someone considering an Oahu honeymoon? 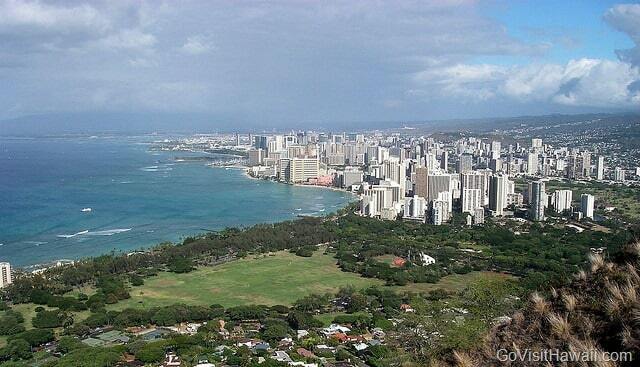 The only point you might want to consider about honeymooning in Oahu is whether Waikiki is a good fit for you or not. Some people love Waikiki while others would much prefer to stay elsewhere. To some, Waikiki is crowded and noisy. Others find Waikiki’s urban tropical environment to be fun. 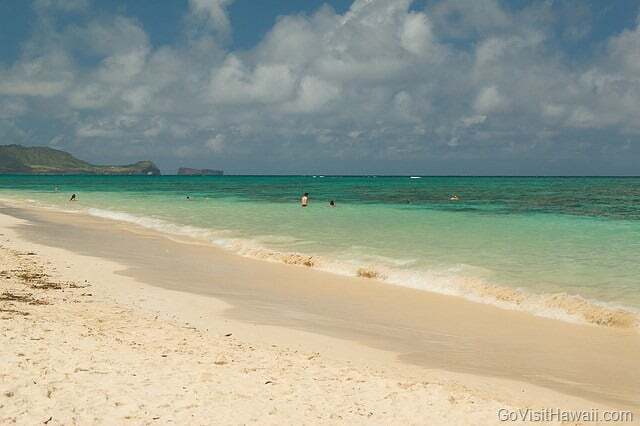 Check out our Oahu vacation guide for more specific Oahu trip planning details. Our customizable, seven-day Oahu vacation itinerary makes Oahu honeymoon planning easy. Also review our popular first-time guide to Hawaii vacation planning. I like that you mentioned Shopping… Nobody selects Waikiki as a destination because of the world-class shopping… Not on a conscious level anyway. But when people are interviewed as they depart, shopping is overwhelmingly the #1 activity. Nothing else even comes close. Not in time or money spent. It doesn’t matter what metric you use to measure it. People LOVE to shop and there’s absolutely nothing wrong with that. IMO – Things like Hawaiian jewelry makes a great souvenir. That’s interesting to hear that surveys show that people love shopping the most. Good suggestion about getting Hawaiian jewelry. We like getting pieces of art – some originals, some prints. They are harder to get back home, though. The biggest recommendation I have for honeymooners (visiting Oahu specifically) in terms of places to visit is indeed the North Shore. My wife and I spent much of our time during the day on the Northshore and our evenings in Waikiki (we’ve visited twice now and intend to return again). We love Oahu and have heard complaints that you don’t get a real Hawaiian experience there – which we disagree with – it’s just a matter of how you plan your trip – don’t spend the entire time in Waikiki – enjoy the entire island. Our favorite location is the Kualoa Ranch – we could spend every day there and be happy.